Greece is located at the southern edge of the Balkan Peninsula. The country's topography is mostly mountainous. There are small plains and valleys between the mountains and they are the main agricultural areas. The climate is typically Mediterranean over most of the country, with warm-to-hot summers and mild winters. Usually there is little or no rain in the summer, but quite often the dry season may start as early as April and finish in fall. Southeastern Greece, including the area around Athens and the Cyclades Islands in the Aegean Sea, has annual precipitation of less than 400 mm, which is one of the lowest in Europe. Average annual temperature varies between 14.5°C in the north and 19.5°C on the southernmost island of Crete. 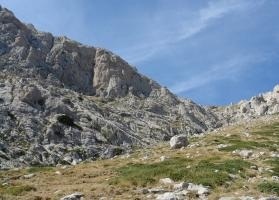 Absolute minimum temperatures at high elevations in northern Greece may approach –25°C. In the summer, maximum temperatures occasionally reach 42-45°C at various inland locations. The influence of the Mediterranean Sea that surrounds the country on three sides helps to moderate the air temperature in most areas. In Greece, forests and woodland account for 49% of the country’s territory, 57% of which are deciduous and 43% conifers. The main tree species are: Quercus sp., Pinus halepensis, Abies sp. and Fagus sp. The forest cover in Greece is low. 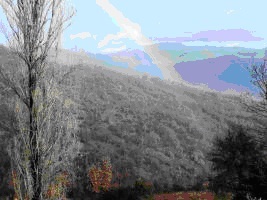 Nevertheless, Greece has a significant diversity of forest ecosystems. This diversity is due to the rich flora, the diversity of climate types, the diversity of geological formations and rocks, the existence of peninsulas and islands (Greece has 42 peaks over 2,000m high), the geographical position of the country among 3 continents and the historical, economic and social changes. 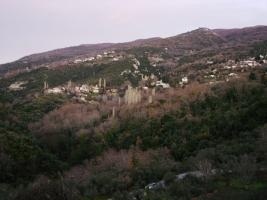 Mediterranean evergreen forest. 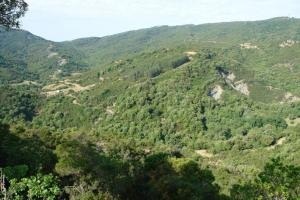 At low altitudes, the dominant species of evergreen broadleaved are Ceratonia siliqua, Pistacia lentiscus, Olea europaea, Arbutus sp., Quercus coccifera, Quercus ilex, Erica sp..
Forests of Pinus halepensis, Pinus brutia, are found in patches in the coastal lowlands and occasionally up to 800m high. The forests are rather open, and have a shrub layer of evergreen species, such as Juniperus phoenicea, Quercus coccifera, Phillyrea latifolia, Calicotome villosa, Erica arborea, E. manipuliflora. 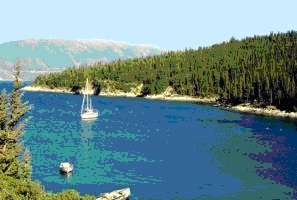 Cupressus sempervirens is native in Crete and the East Aegean islands. Macchie or maquis. 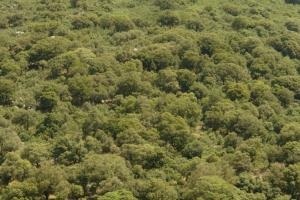 The term “macchie” or “maquis” is used to describe a dense sometimes impenetrable, scrub vegetation, generally 1.5-3.5 m tall which is mainly composed of hard-leaved evergreen species such as Quercus ilex, Arbutus unedo, A. adrachne, Laurus nobilis, Myrtus communis, Erica arborea, Pistacia lentiscus, Phillyrea latifolia. Macchie also is composed of some deciduous shrubs such as Cercis siliquastrum, Cotinus coggygria, Ostrya carpinifoliaand Pistacia terebinthus. Phrygana. The term "phrygana" is used for an open dwarf shrub dominated by low, often cushion-shaped, aromatic, spiny or grey-leaved shrub. 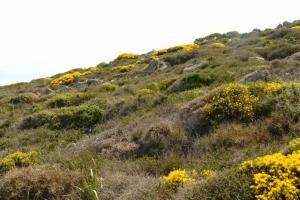 In islands and degraded evergreen broadleaved forests, (as a result of long and frequent fires) there are areas covered by “phrygana”, with dominating species of Cistus sp., Sarcopoterium spinosum, Coridothymus capitatus, Euphorbia acanthothamnus, Saturejia sp., Anthyllis hermanniae, Micromeria juliana. Deciduous forest. Quercus pubescens and Q. frainetto are the most widespread species of deciduous oaks generally occurring in the hills and lower mountain slopes between 300 and 800m high, in the more continental parts of the country. Other deciduous trees and shrubs commonly found in this zone are Q. cerris, Ostrya carpinifolia, Carpinus sp., Fraxinus sp., Acer sp., Coryllus sp., Tilia sp., Aesculus hippocastanum. Well-developed natural forests of Castanea sativa occur locally in central and northern Greece. Montane coniferous forest. Large coniferous forests, dominated by either Pinus nigra, or by Abies occur on the mainland at altitudes between 600 and 1,800m. The genus Abies is represented by the endemic A. cephalonica in the south, A. x borisii-regis in central Greece, and A.alba locally in the north. Pinus sylvestris forms forest locally on non-calcareous mountains in the north. In the same zone, broadleaved deciduous Fagus sylvatica and Fagus orientalis form pure stands on the richer and deeper soils. 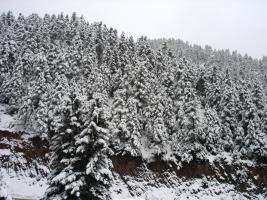 In higher altitudes, over 1,800 m., there are forests such as Juniperus foetidissima and Pinus heldreichii. 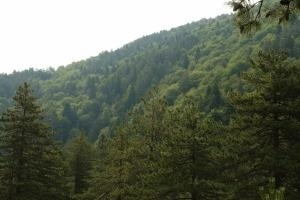 In northern Greek borders and at medium altitudes, we can also find forest sections of Betula pendula, Larix decidua, Pinus peuce and Picea abies species. Subalpine and alpine communities. 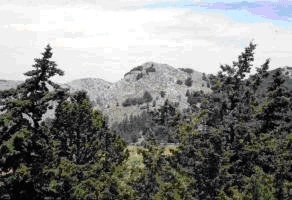 The timberline is generally formed by Pinus or Abies, in northern Greece sometimes by Fagus, and on Crete by Cupressus. 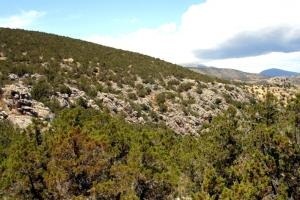 Over 2,000-2,200 m high the areas are covered with species of low-growing shrubs such as Juniperus communis ssp. nana,Astragalus sp., Daphne oleoides, Acantholimon echinus, Arctostaphylos uva-ursi, Vacinium sp..
Lowland cliff vegetation. 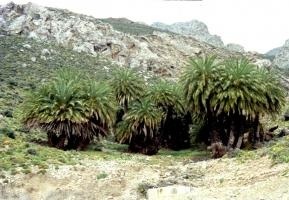 Limestone cliffs and to some extent also cliffs of siliceous rocks, especially in the Aegean region, are of great botanical interest, with a characteristic flora called “chasmophytes”. The chasmophytes are generally long-lived, woody-based perennials. Riparian vegetation. 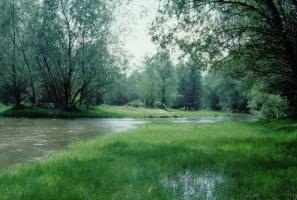 Streambeds at low altitudes are generally lined by trees of Platanus orientalis, Nerium oleander, Vitex agnus-castus and at higher altitudes Salix sp., Alnus glutinosa, Fraxinus angustifolia, Populus sp..